A/B testing has evolved from a simple comparative study to a process backed up by a data-driven approach. Here are some some inside tips and tricks which can help you get huge uplifts in your business metrics. 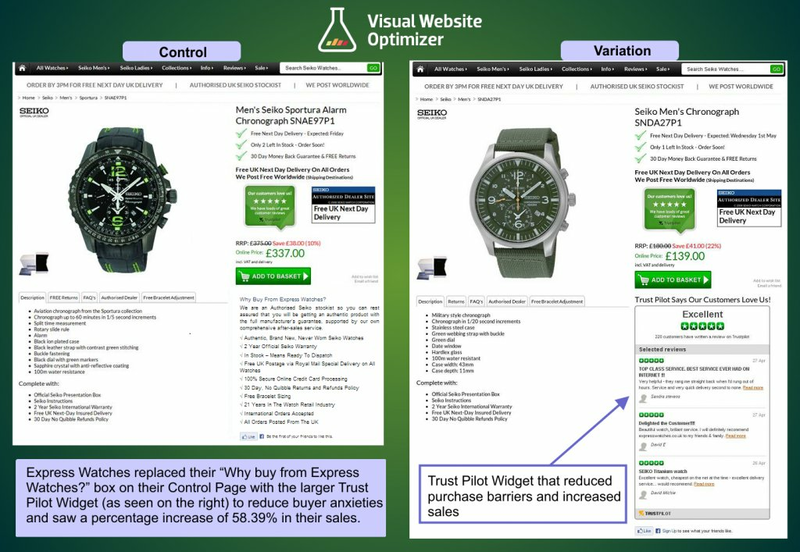 The post A/B Testing Insights Through Ecommerce Customer Journey appeared first on Blog. A seamless eCommerce customer journey is about transitioning from just “buying” to “experiencing.” The key to growing your online business is to let your customers explore, decide, and share, and then learn from their experience. Over the years, A/B testing has evolved from a simple comparative study to a process backed up by a data-driven approach. Businesses and website owners can utilize this approach at every stage of their customer journey. In this blog post, we take you through some inside tips and tricks which helped VWO customers get huge uplifts in business metrics such as conversions and revenues. Take notes as you read this blog, as the next big testing idea for your own ecommerce store could come in from here. A splash page is a screen that pops up when you first enter a site. As splash pages are the pages visitors see first when visiting a website, these are also an important source of revenue. Let’s first look at some of the industry best practices regarding splash pages. Make the key message and the exit button both easily visible. While interested visitors should be able to move through next steps, the disinterested ones should also be able to move through, that is, exit the splash page easily. Make sure your users interact with your splash page first and then the page they are looking for. Design the user/visitor flow such that those who have already visited your splash page don’t get to see it again. This should be spaced out based on factors such as time span, say on a revisit after 7 days. Warner Music Group, an American multinational entertainment and record label conglomerate headquartered in New York City, noticed that conversion rates were lower than the industry average. They redesigned their splash pages, and ran 3 A/B tests before making these live. In the variation, the image on the left was resized and moved below the content. The purpose was to provide a quick snapshot to the visitor in one go. To learn more on how WMG went through with their other tests and execution, you can read the complete case study. Your home page is the entrance to your store. Jazz it up with the very best of what you have got. Convey value proposition straight up. 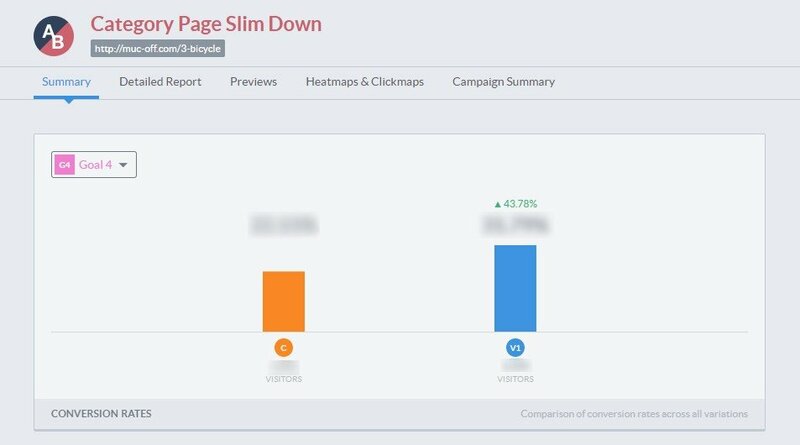 What a visitor sees in the first few seconds on your home page is crucial. It’s important that you communicate your value proposition instantly, and don’t come across as just another mom & pop store. Have an easily identifiable Sale section. Fish all the discounted products on your home page, and line those up in a separate section that’s dedicated to them. Organize the navigation bar. Make sure your visitors easily find their way around your website. Place the navigation bar at the standard positions where visitors expect to find them. You can also make your navigation bar persistent. 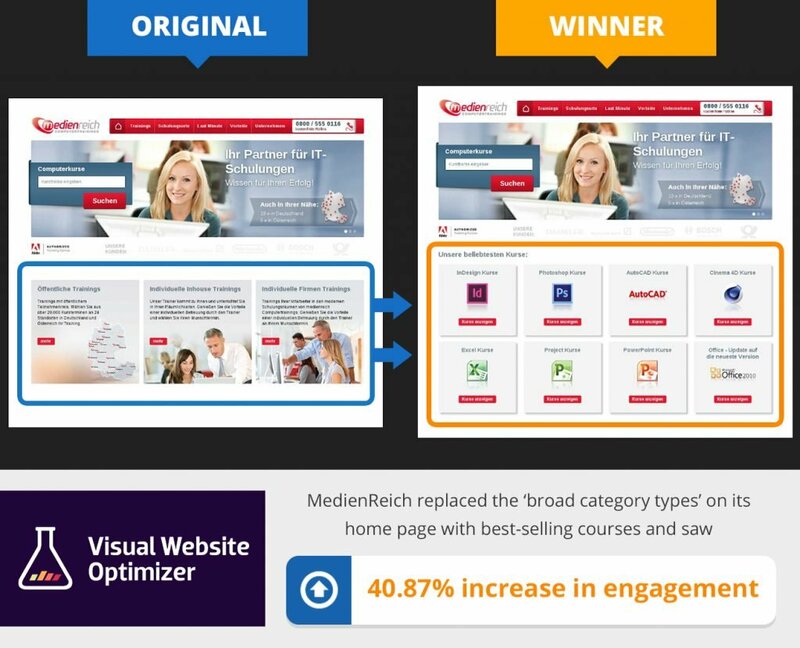 MedienReich ComputerTrainings, a German company which provides various software training courses, also applied the same learning and increased website engagement by 40%. They replaced the 3 broad category types with 8 of their best-selling courses, such as Photoshop, InDesign, and AutoCAD. Provide right information in right order. You can learn more about the MedienReich success story. When it comes to category pages, every action requires equal caution. For such pages, you need to plan per your product type and page layout and design than following an industry best practice blindly. Be it how your products are displayed, the position of the search box, or the number of filters, every field or option should be used with discretion or should be tested and used accordingly. For example, Buyakilt.com added filters to increase their revenue by 76%, but UKToolCentre considered filters as a distractor for a particular category and had these removed to increase their engagement by 27%. When the focus of a website is to have customers sign in and then buy, it’s important to maintain customer focus and continuity. Muc-Off offers a broad range of cleaning products for bicycles, motorcycles, and other motor vehicles, and electronic goods. Its products are sold through major retailers around the world as well as through its website. When Spot Studio, an agency hired by Muc-Off, also tried applying this learning, they observed that their design caused incongruity in user experience. Visitors came there to purchase products; but after landing on the page, they were finding information resources instead of a shop front. The test they did after rearranging their departments page (or the category page) gave them 43.78% more product views. Here’s the control-variation comparison, as noted on VWO Heatmaps. To find more about what Muc-Off did to improve the customer experience on their category page, here’s the complete case study. Consumers read an average of 10 online reviews before feeling able to trust a local business. 57% of consumers will only use a business if it has 4 or more stars. 89% of consumers read businesses’ responses to reviews. Express Watches, a client of VWO’s Certified Partners, High Position, is an authorized Seiko watch dealer that ships to over 23 countries. They have been in the watch retail industry for more than 21 years and believe in getting the basics right to satisfy their customers. Considering the challenges related to replicas plaguing their industry, Express Watches also decided to use the above learning to reinforce their brand positioning. However, to reduce visitor anxiety and achieve the desired results, they included a TrustPilot widget with some great customer reviews. These were tested against the erstwhile section Why Buy From Express Watches? The variation was declared the winner with a percentage improvement of 58.39% and 99% chance to beat original, as shown below. To read the Express Watches case study in detail, click here. $260 billion are recoverable through checkout optimizations of just US and EU e-commerce sales. As an eCommerce business owner, it’s important that you regularly interact with your customers and new visitors to get ongoing feedback about their experience, as you wouldn’t want to lose them at the final gateway, that is, the checkout stage. 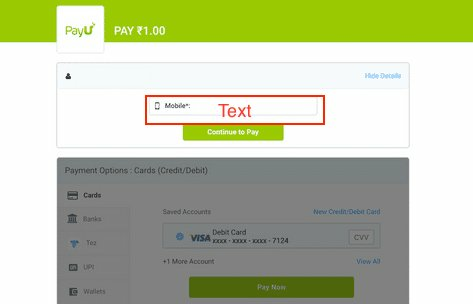 PayU India is the flagship company of Naspers group, a $93 billion Internet and media conglomerate. 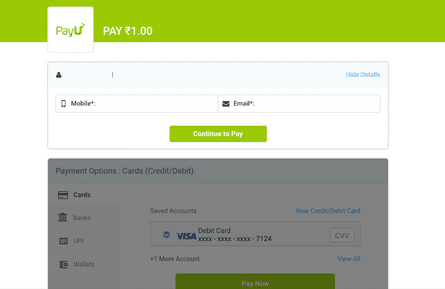 Through its proprietary technology, PayU provides state-of-the-art payment gateway solutions to online businesses. The concern for PayU was checkout page drop-offs. Through VWO’s Visitor Recordings and Heatmaps features, the PayU team found that providing communication information was a key friction point. They hypothesized that dropping the less important of the two fields—the telephone and the email—would help them increase conversions. They tested the variation without the email field against the control. The results demonstrated that dropping the email field showed a statistically significant improvement of 5.8% compared to the control. While the above A/B testing ideas worked for these companies, these may not necessarily work for you as well. These case studies should provide you insights and ideas on how you can create strong hypotheses and test these further. 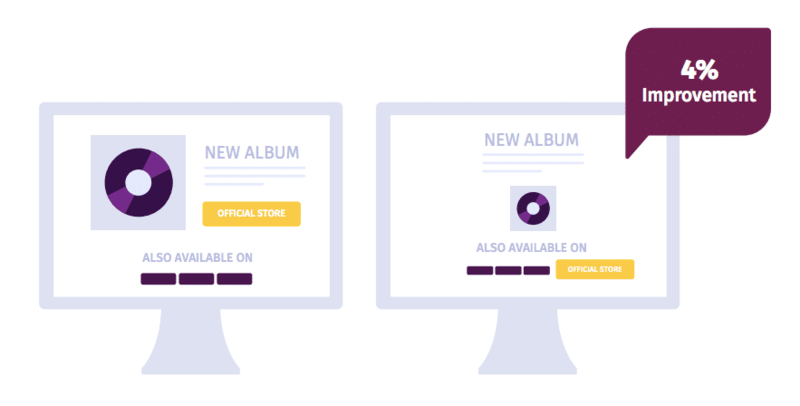 These examples should give you a good idea as to how A/B testing can be a good starting point for conversion optimization and the extent of results you can achieve through testing. Do share your A/B testing experiences in the Comments section below. Bayesian vs Frequentist A/B Testing – What’s the Difference? Please click on the title to read the full article!